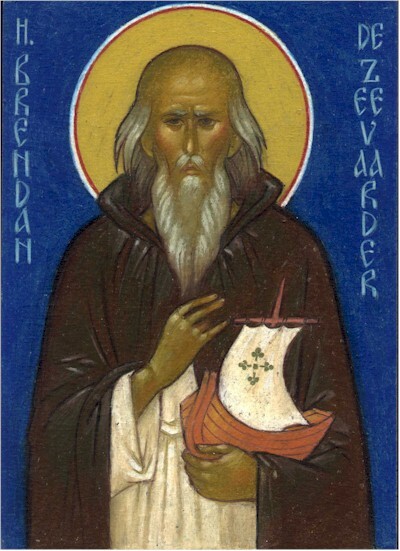 Our venerable and God-bearing father Brendan the Voyager (or the Navigator) was a sixth-century Irish Orthodox monk. 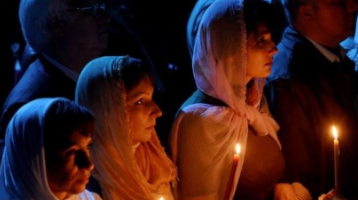 He was perhaps the first Orthodox Christian to set foot on Canadian soil, and as such, is the first of the saints to set foot in North America. He is also known as Brendan of Clonfert. St Brendan was born around 484 at Tralee in Kerry, Ireland. He founded several monasteries in Ireland, including Cluain Ferta Brenaind (or Clonfert) in County Galway. His missionary and pastoral travels took him on voyages to the Scottish islands, and possibly to Wales. He reposed in peace in 577. A Latin chronicle of the early ninth century, Navigatio Brendani (The Voyage of Brendan), made him the hero of a Christian adventure that included voyages to unknown lands far to the west of Ireland. The account indicates that Irish voyagers visited America as early as the 8th century, before the Vikings; but whether St Brendan himself made these voyages is disputed, based mainly on questions as to whether a curragh, the sea craft on which Brendan sailed, would be able to make such a journey. In 1976, Irish explorer Tim Severin built an ox leather curragh, a replica of the sort Brendan would have used, and over two summers sailed from Ireland via the Hebrides, Faroe Islands and Iceland to Newfoundland to demonstrate that the saint’s purported voyage was feasible. On his voyage, he encountered various sights such as icebergs and sea animals such as whales and porpoises which he suggests are factual counterparts to the fantastic sights from the legends of Brendan. Holy Father Brendan, pray unto God for us! Wherefore, O holy father, thy spirit rejoices with the Angels.